Well, since the depression of 2008 hit and the whole American economy went into a tailspin the American Government had to go into default to get out of debt. 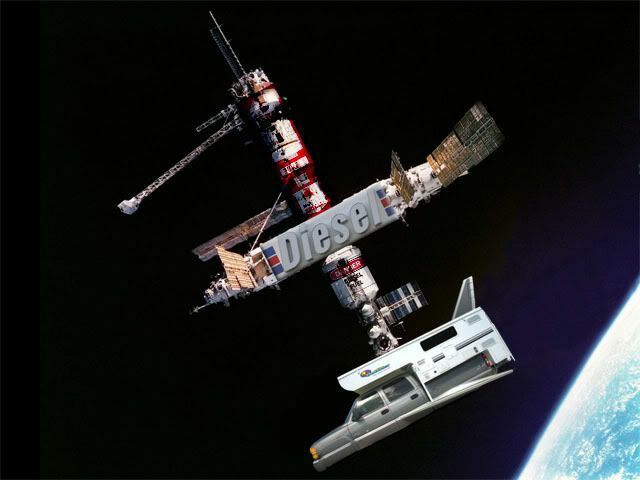 In fact NASA went belly-up and was bought out by the huge consortium of truck campers known as RVNET. All motorhomes, trailers and 5th wheels were confiscated as housing for all previous government employees and are no longer a viable part of RVNET, since they are all permanently parked and now up on blocks. So needless to say camping is no longer earth-bound. 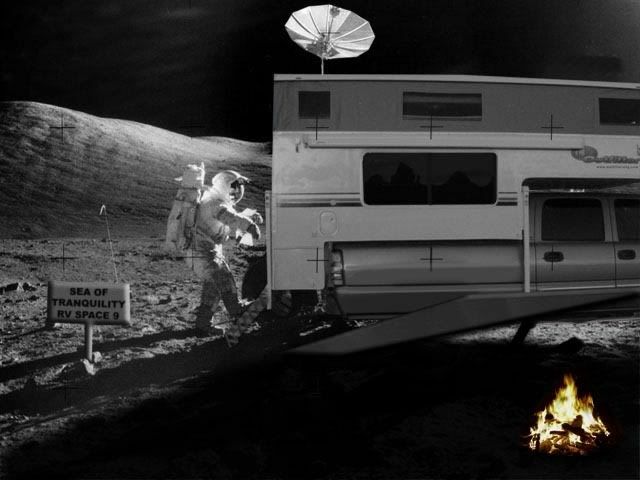 Of course the first part of any moon-based camping is getting a ride to the RVNET Space Center. 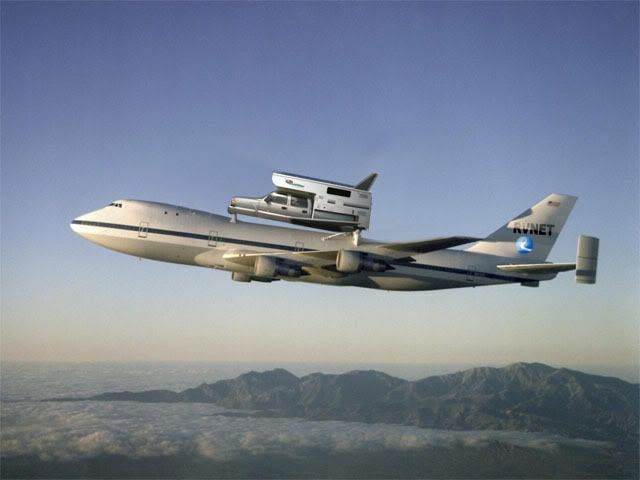 And then being loaded up to the booster for the trip out of earths gravity. Luckily for us GMC is the only truck manufacturer still producing thanks to the demand for it's Classic Series trucks. Ford and Dodge...bankrupt, but still around due to the fanatic owners recycling of used parts. 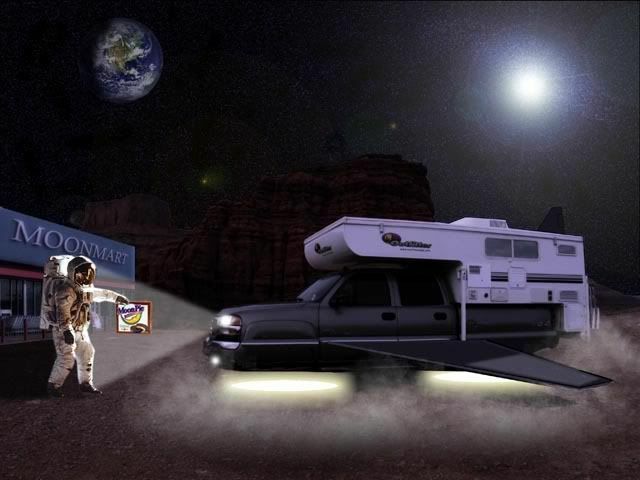 And of course Outfitter Campers the camper of choice for off-world camping because of it's low weight and center of gravity. 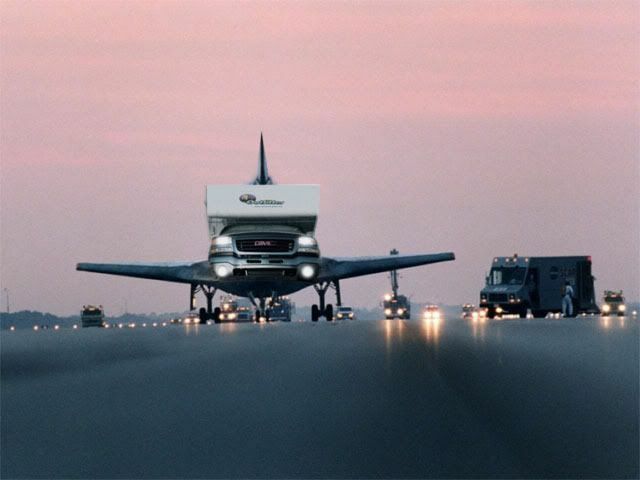 I did opt for the Bachman/Turner Overdrive Unit, (BTO, named after 2 rock gods of the 70's) to escape the global funnel cloud left over from President Bushes' failed economic policies. It continually tries to create a vacuum by sucking the life out of all global economies. 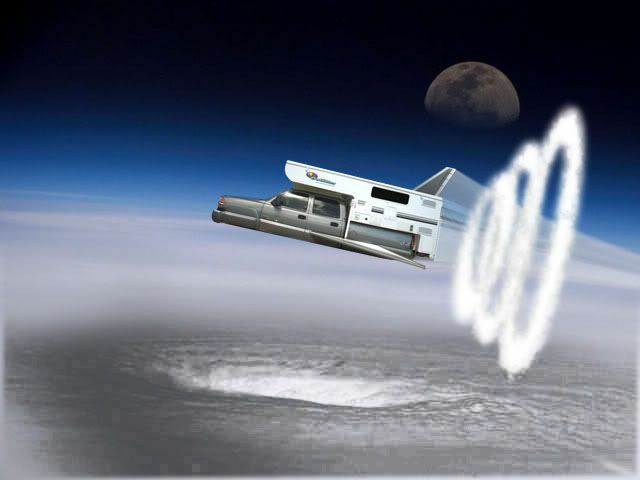 Hey, escaping gravity is one thing, but getting past the Bush Funnel Cloud isn't rocket science. Finally past the "Cloud" I decided to go outside for some fresh air and a walk. Before too long we spotted a Space Station and figured we'd fill up for the rest of the trip. 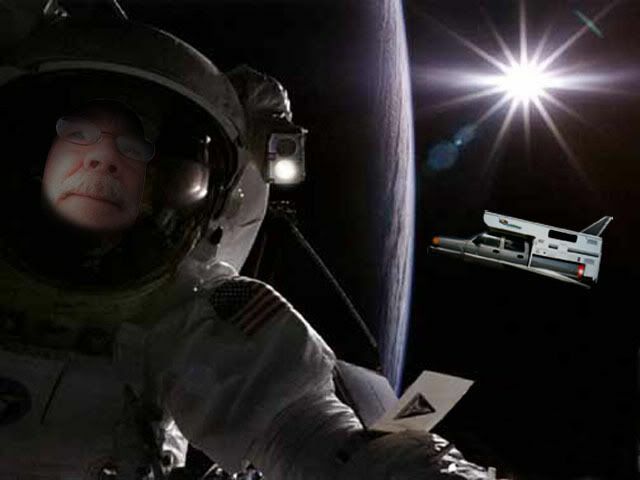 You get more for your money in space, what with the temp of diesel far below that of back home. Even with the tank heaters and all. By the way, RVNET is also now an oil producing company and of course subsidizes all TC expeditions with lower fuel prices as long as you post a trip report. 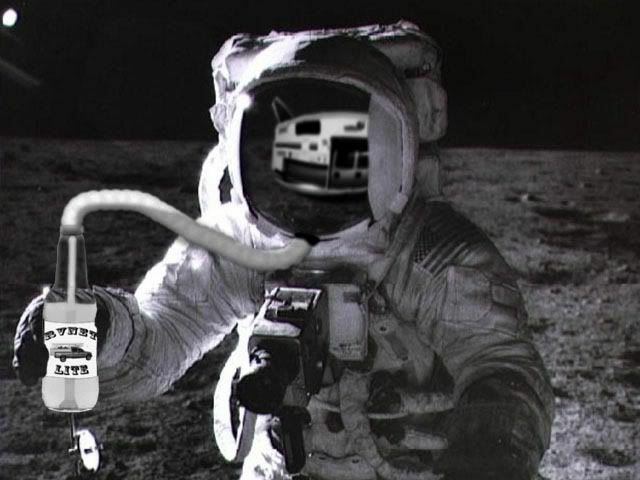 First off after landing on the moon was stopping at Moonmart for some snacks...Moon Pie! An old favorite of ours from way back in the day. Then to wash down the Moon Pie with some beer! However beer and Moon Pie didn't seem to sit too well. 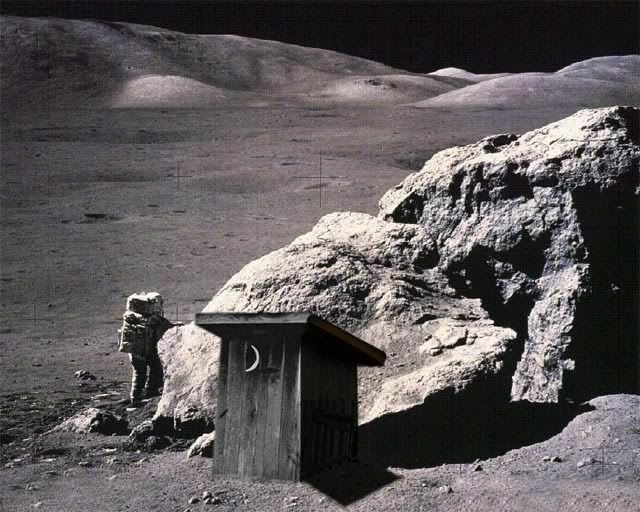 After the toilet fiasco at the Space Station of 2008 it was decided that low-tech was better in some instances. Feeling better, we've finished watching the HG fire and headed inside to watch some satellite tv. Sure glad to have reserved a campsite here as they fill up fast on the weekend. So the weekend is over and now back to earth and work. 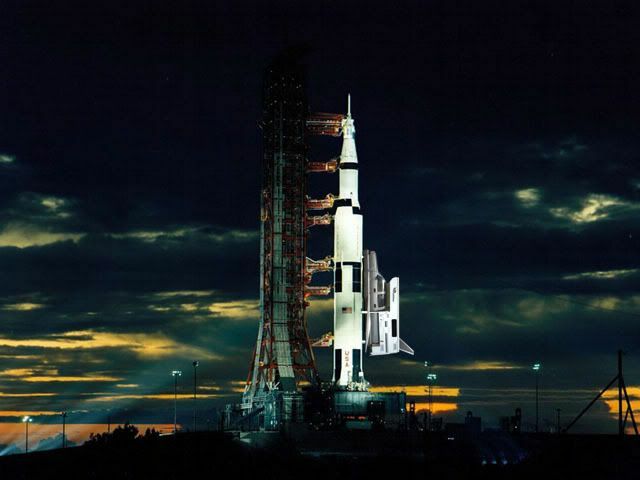 It's time to dump the waste tanks before re-entry. Thanks for reading and feel free to add...anything. Nice trip, appreciate you taking the time to post. Being retired hubby and I have reservations for next week. Oh yeah, R.C. 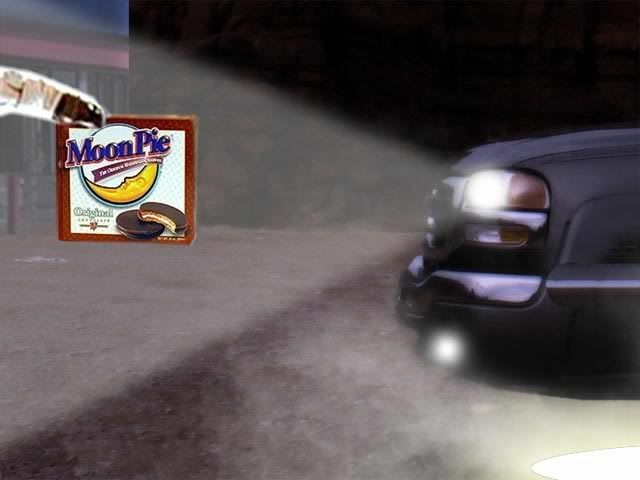 Cola is the choice of drink for Moon Pies. Proud owner of 2 Barth motorhomes and a Barth Trailer. In the future, are GM's retired assembly line workers still trying to soak the company dry? Hey, it's the future, write it the way you want it! I'm thinking retired GM workers are as well off as retired Microsoft employees. And RC Cola it is. Maybe Dr. Pepper? Dave, you better move to a cooler climate -- FAST!! Actual, the moon might be good place for you. 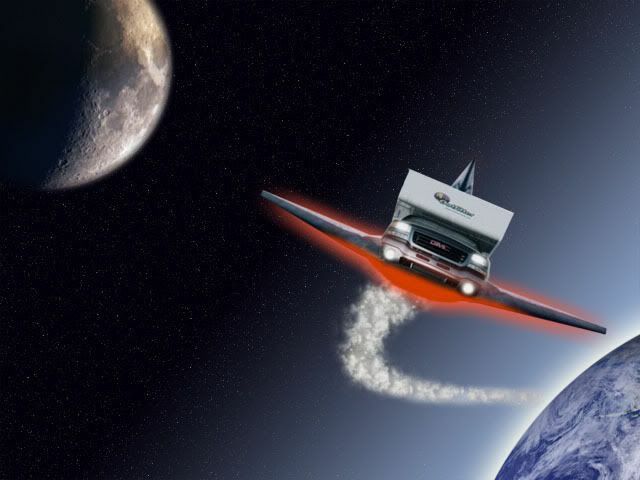 I am thinking a little further into the future. You just sit back, close your eyes, and camp any place you want, with any truck or TC. I want the B T O-verdrive!! Then I could "Take care of business" COOL!